The aim of Kharkiv School of Photography: Soviet censorship to new aesthetics’ program of exhibitions is to provide a historical awareness of the emergence and the ideological and aesthetic development of the Kharkiv School of Photography from late Soviet (1970's – mid 1980's) to post-Soviet (mid 1980's – 1990's and 2000's) periods. The Kharkiv School’s achivements (as a school of thought), with an exception of two or three individuals, are not well-known internationally. This three-part exhibition provides a curatorial and critical platform for a program of online and physical exhibitions, educating and engaging the audience with the history and achievements of Kharkiv School of Photography, formed in the city of Kharkiv (Kharkov), Ukraine. 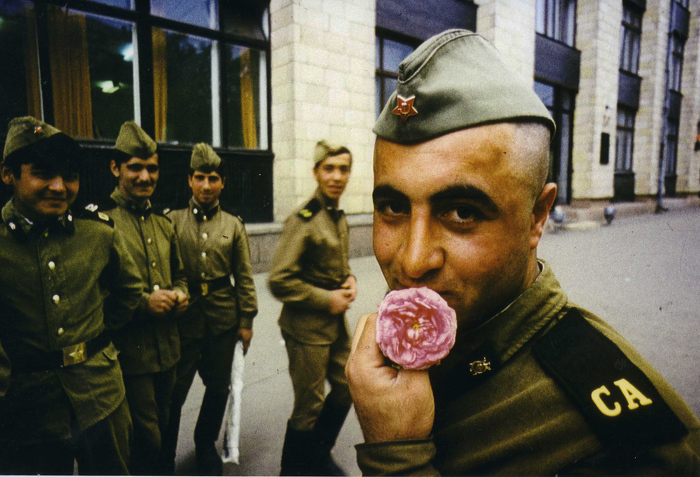 In early 1970's, resisting the aesthetic criteria imposed by the socialist realism doctrine, eight photographers in Kharkiv, created complex images free from predetermined ideological prescriptions. Joining efforts in fighting the Soviet aesthetic canon they formed the Vremya group (Anatoly Makienko, Oleg Malevany, Boris Mikhailov, Eugeny Pavlov, Juri Rupin, Alexandr Sitnichenko, Alexandr Suprun, Guennadi Tubalev). For 15 Soviet years, despite censorship and persecution by all sorts of ideological watchdogs, official art critics to the KGB who would search their darkrooms and apartments, and despite the closing of exhibitions, the artists managed to secretly create new art and exhibit it. This underground artistic movement gave life to a new avant-garde aesthetics in photography which was taken further during the Perestroyka years (1986 - 1991) when ideological barriers were gradually dropped. A new generation of photographers (the Gosprom group - Sergey Bratkov, Igor Manko, Guennadi Maslov, Konstantin Melnik, Misha Pedan, Leonid Pesin, Boris Redko, Vladimir Starko, as well as non-aligned artists Andrey Avdeyenko, Igor Chursin, Igor Karpenko, Victor Kochetov, Roman Pyatkovka, Sergey Solonsky and others) adopted and further developed the new aesthetics, thus postulating the emergence of a school with common goals and shared principles. The 2000's showed further dissemination of Kharkiv School ideas. In 2010 the Ukrainian Photographic Alternative (UPhA) Association was formed to bring artists together from all over the Ukraine in an effort to withstand the onslaught of traditional tastes found in the National Photography Union. Misha Pedan and Roman Pyatkovka, the Kharkiv School 'second generation' photographers, are among UPhA's founders and coordinators. A number of younger emerging artists, both from Kharkiv and other regions of Ukraine, use this aesthetic context as a springboard in their artistic research, continuing the traditions of Kharkiv photography today. This three-part exhibition is designed to bring to light the role and the aesthetic achievement of Kharkiv photography. It will exhibit online and on-site the work, interviews, videos, and other documents to illustrate the evolution of the Kharkiv School of Photography, the artists’ struggle for their freedom of expression, and contemporary art photography movements in Ukraine. We welcome your comments. VASA Exhibitions are the result of various curators, artist, and photographers.